Condition: Bone Break. Ligament damage requiring orthotic. Doxies are notorious for trying to do the impossible. Brave and tenacious, they are eccentric little characters of the dog world, always pushing the boundaries to see what new adventures lie around the next corner. And Dexter is no different! But his curiosity almost got the better of him... Read his dad's harrowing story to find out what happened to them both during an otherwise pleasant stroll along the cliffs! 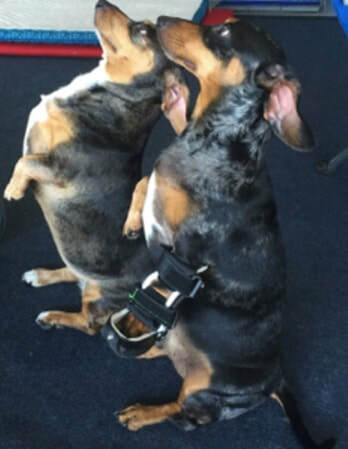 On July 5th, [I was walking] my 2 dachshunds at Miramar [when] Dexter found a hole that he was SURE [had] a rodent and was actively sniffing it. Circling around the hole, Dexter didn't realize he was at the edge of the cliff, and he fell off. It happened right in front of me! I ran to the cliff, looked down to see my boy screaming in pain, shaking, and holding his paw. In that split second, I jumped down after him, thinking I could slide down the cliff to save him. But my foot caught and snapped and I shattered my leg in 3 places! Some people on the beach called 911 and the paramedics carried me and Dexter off the beach. We raced to get Dexter to the emergency vet and then I went to the hospital, where I had to spent 5 days after undergoing surgery! When Dexter was released from the emergency vet, he was sent home with some pills but no support for the suspected hairline fracture of his leg and the moment I saw him, I knew something was wrong! Even in my own cast, I rushed him to our local vet in Pacifica, where they put him in a splint for support. After a consult with a surgical specialist I was told it was a case of ligament rupture, he would need Carpal Arthrodesis surgery, and that Dexter's procedure would cost as much as $6300! I do not have that kind of money, and am at a complete loss about how to go about helping my little boy. I'm so sad about it. Maybe you can see Dexter and give me your opinion of an alternate treatment?" Of course, Dr. Strubel had alternative options to offer Dexter for treating his injury. Knowing that David really hoped to avoid having surgery performed on Dexter Dr. Ilana worked with A Well Adjusted Pet's partner, OrthoPets, to create a custom carpal orthotic (wrist brace) for Dexter in order to stabilize and support his carpal joint without needing to surgically fuse his bones. Dexter is now doing great in his custom carpal orthotic. We knew we had to use it to limit the movement and stop the grinding of the unstable wrist bones in Dexter's carpal joint. These bones were rubbing against one another due to the damage he sustained to his ligaments when he tumbled down the cliff-face. The device I created also stops the pain and reduces inflammation when he walks, allowing him to fully bear weight on his injured leg even when running! And he doesn’t even seem to notice it is on when playing with his sister Bailey and his dad! Despite dire predictions, he needed no surgery and had less pain and a quicker return to function. David is happy and Dexter is back to his old squirrel hunting tricks. Just not on the cliffs along the beach! And the latest report from David is that Dexter is able to finally place full weight on his injured leg without pain and swelling. Dexter is now 5 months out since his injury and he is getting around really well even without the brace on. It’s clear that he’s feeling great! David is really glad that he was able to treat his boy without surgery.